If you’re selling your home in Maryland without considering today’s trending paint colors, you could be leaving money on the table. A recent study by Zillow analyzed today’s popular paint colors and determined which ones add value and which ones detract. This color hack has been used for years to create the perception of value to help homes sell for the highest price. Think about it, whenever a potential buyer enters your house or views your listing online the first thing their eyes consume is your chosen color scheme. This sets the tone for the initial impression and expectations for your home. Colors have an impact our emotions and we all know that buying your dream home is an emotional decision. When a buyer falls in love they’re likely to pay a higher price. It is a combination of proper preparation and seasonal timing that can sell your Maryland home for top dollar. 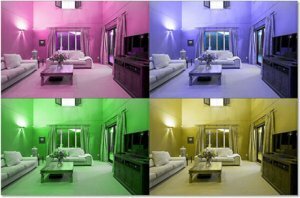 To give perspective, we’ve demonstrated the impact by applying different colors to the same room using programmable LED lighting. Which room looks more inviting? Which one appears cold and off putting? A good Realtor in Maryland must have an understanding of home designs are trending. They should make recommendations to their clients the will not only add value but decrease the home’s time on market. Some stylistic decisions have a greater impact than others. While there are frequently numerous improvement that a homeowner can make, paint color often has the highest return on investment. This should be a serious consideration if you want to sell your Maryland home for the highest price. The way a buyer perceives your home has a significant impact on how it is valued and paint color is what catches them emotionally. When interviewing a Realtor ask them what designs choices are trending in the market. If they’re tracking trends then they will likely maintain a public Pintrest board or a Houzz account to document modern designs. A Realtor who’s able to sell your Maryland home for the highest price must stay in front of market trends. The kitchen is the heart of a home. It’s where everyone gathers during holidays and the place where families share meals. Buyers spend a lot of time in the kitchen during showings. Zillow has found that houses with soft gray-blue kitchens sold for $1,809 more than average. 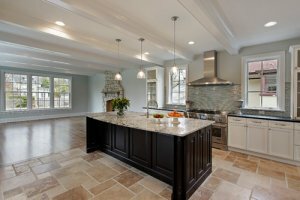 The right kitchen color can be a deal maker if you’re looking to sell your Maryland home for the highest price. Periwinkle blue bathrooms sell for $5,440 more than average. The bathrooms are where buyers look to determine your home’s craftsmanship. Do you have basic white ceramic tile or did you opt for natural stone? Are the toilets seamless or are they contractor grade from 1987? Are the vanities modern with granite counter tops or laminate with plastic hardware? While tile and custom vanities can cost you a small fortune, an attractive pain color can give the perception of quality with a low price tag. 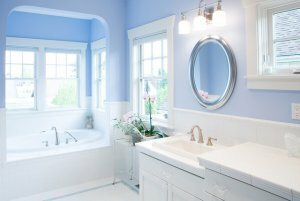 Zillow found that bathrooms featuring light pale blue to soft periwinkle blue color schemes sold for $5,440 more than comparable properties. Living rooms are where families spend quality time together. It’s where kids open presents on Christmas and Mom and Dad unwinds after a long day at work. If you want to sell your Maryland home for the highest price then the living room needs to be inviting. Living rooms with walls colored light beige, pale taupe or oatmeal-colored can add $1,926 of value to your home’s sale price. A trend we see in today’s real estate market is home owners painting their entire home a single popular color. Grey seems to have taken over the same way that white did in the early 1990s. While it may seem like a good idea to follow the trend many professionals advise otherwise. 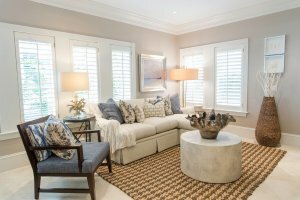 Supported by the Zillow study, the new opinion is that for future living room design Grey is out, Beige is in. Science has shown that grey can create a negative mood and a feeling of sadness. This is not what you want when a potential buyer enters the room. You want them to feel enthusiastic and upbeat so that they view their experience in your home positively. Nothing is better than relaxing in bed after a long day. While we all want our bedrooms to reflect our personality, sometimes simple is better. A soothing paint color can make falling asleep easier and provide a relaxing start to a new day. In today’s market calm blue bedrooms are trendy and can catch a buyer’s eye. 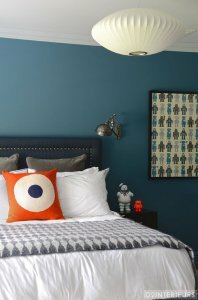 Bedrooms that are painted a color between cerulean to cadet blue can add a $1,856 premium. That’s a serious increase if you’re sell your Maryland home for the highest price. How would buyers like guest to perceive gatherings at there house? This can vary wildly between high-end and upscale to personable and modest. You need as many interested buyers as possible if you want to sell your Maryland home for the highest price. To appeal to the largest buyer pool possible you need to understand what colors cover the largest span of entertainment styles. Zillow’s study found that homes with slate blue to pale gray blue dining rooms had higher sales prices than comparable homes. These homes sold for $1,926 more on average than homes that featured white dining room colors. Whatever your entertainment style says about you, we can conclude that very few people want to come across as stark or bland with a white dining room. Welcome home! How should your home greet potential buyers when they pull into your driveway? They should feel comfortable, welcomed, and overall excited by a neutral style that they can make their own. For exteriors you should go with colors that any buyer can transform into their home. Greige exteriors, a mix of light gray and beige, make a great blank slate and sold for $3,496 more than similar homes painted in a medium brown or with tan stucco. Exterior color choices can have a significant impact when you’re trying to sell your Maryland home for the highest price. Never mistake a lack of color as curb appeal. While you want most of the home to be neutral, the front door is used to provide personality and differentiate your home from others on the market. With competitive market you need every advantage to sell your Maryland home for the highest price. 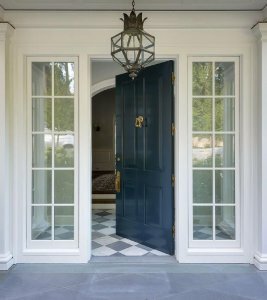 Front doors with shades of dark navy blue to slate gray sold for $1,514. If you’re thinking about listing your home and would like an evaluation from a local, professional Realtor then fill out this form. We have extensive experience providing recommendations that result in higher sales prices for our clients. Our clients love our proven color schemes that can help get you a fast contract for top dollar. What do you have to lose? We’re ready to sell your Maryland home for the highest price.